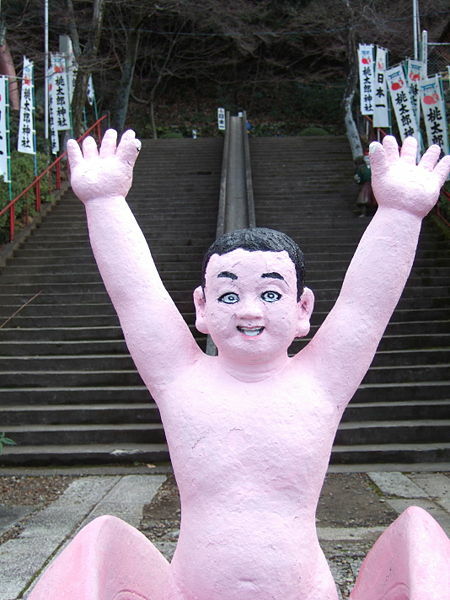 A naked boy proudly welcomes the visitors at the main gate of a shrine called Momotaro-jinja in Inuyama, [W:Aichi Prefecture]. He is the hero from Japanese folk-tale Momotaro (known as Peach Boy), which is also his name. The story starts with the scene where a childless old woman finds a giant peach floating down a river, and she takes it home. When her husband and she try to cut it open, a baby boy came out from the peach. According to a folk-tale, Momotaro was born in Inuyama, therefore, Momotaro shrine was built in the area. 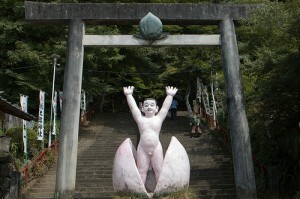 The Momotaro statue depicted the very moment of his birth from a peach, but the face is almost like a middle aged man!